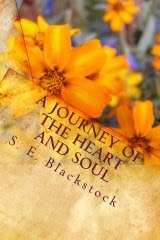 A JOURNEY OF THE HEART AND SOUL - Poetry to Inspire and Sustain is the story of one woman's journey through life as told through her poetry and songs. Intensely personal, her work captures her love of family and God, and reflects her aspirations for truth and beauty, as represented by the eternal values of faith and love. It is also the story of personal growth and perseverance, and lays bare the wellspring of an intensely personal vision that flows from the deepest reaches of her heart and soul.